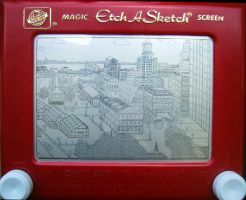 Here's the Brooklyn Bridge on a pocket etch-a-skech. This might be my favorite thing I've done on an etch, I'm not sure I could ever part with it. Luckily, I removed all the sand, so it is permanent. woah that is so beautiful!!! you're so talented and awesome!!! i have an atch and sketches, and i'm not good at it. but you're just so incredieble! awesome job! Ha, thanks. 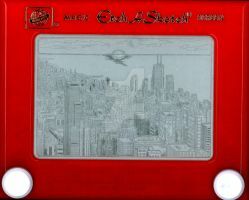 I love drawing with the Etch a Sketch. The added challenge of it makes it more exciting, and it gets a bigger response.. 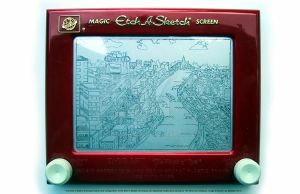 Someday I will paint and draw again but for right now, I'm an Etch a Sketch artist. Your work is just jaw dropping!!!! You are GIFTED big time! Thanks for sharing. I love those toys. I'm so sad that mine got broken. I look at a picture while I draw it and try to go slowly, I guess. Thanks. Wonderful. 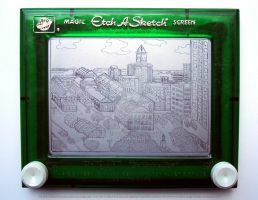 I never had the patience for Etch-a-Sketches. D= NO WAY!!! ITWOULD TAKE ME 3BILLION YEARS TO DO THAT! Thanks for the nice comment, Cookie. I started with stairs, then buildings, then cities! ..............Man, I STILL can't do anything on those damn things. I saw one at the store and tried it. I am ashamed. my current process is to drill holes into the back of the etches then cover the holes with electrical tape. after i finish the sketch ill hold it over an empty garbage (preferably outside) and sift out all the dust. then i re-cover the holes, clean the silver off the etch (soap and water) and it's (mostly) permanent. don't drop it face down on concrete, transference dust will cloud it. sift too hard when emptying and that will also cloud it, which then requires a retrace. thanks so much, brooklyn. glad you dig the etch! thanks, jane sometimes i wonder if i could do these a second time.. i'll probably try this one again someday. perhaps full sized.